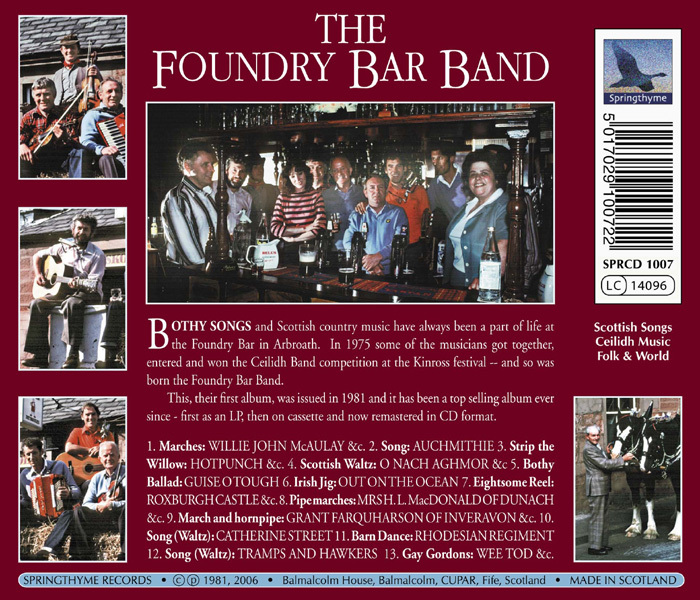 Few bands, professional or otherwise, can so well convey the essential lilt of Scottish music with such enjoyment and enthusiasm as the Foundry Bar Band. The fame of ‘the foondry’ in Arbroath as a musical gathering place has spread far and wide, and on a couple of nights a week the back room is filled to capacity with musicians and enthusiasts from near and far. Bothy songs and Scottish country music have been a part of life at the Foundry Bar in Arbroath ever since the time when the only customers were the foundry workers from over the road (the foundry has long since gone), the fisher fowk from the town, and the fairm chiels in from the Angus countryside for the weekly fairs and markets. In 1975 some of the Foundry Bar musicians got together, entered and won the Ceilidh Band competition at the Kinross festival – and so was born ‘The Foundry Bar Band’. This, their first album, was issued in 1981 and it has been a top selling album ever since - first as an LP, then on cassette and now remastered in CD format. 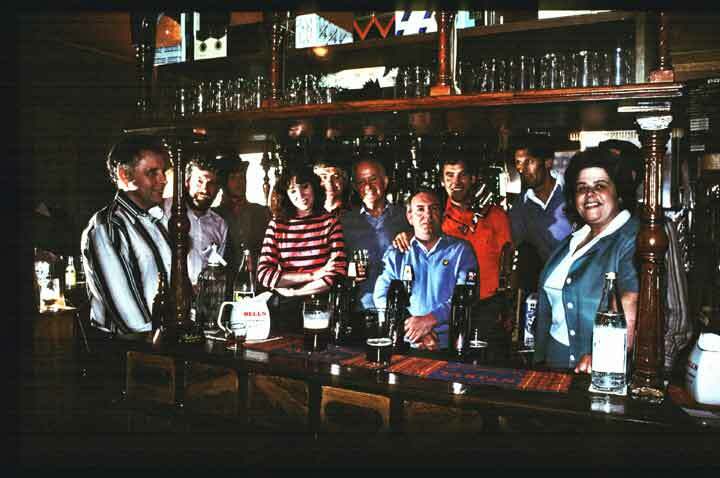 For pictures of the band and the Foundry Bar go to Pictures below. 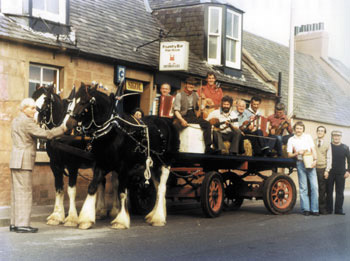 The Band on Angus McPherson's cart with Clydesdale horses outside the Foundry Bar in Arbroath. 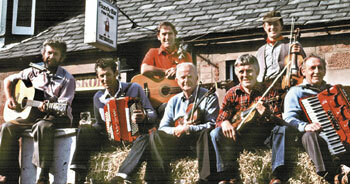 The Band as they were on their first album: Jim Reid (guitar, vocals, mouthorgan), Terry Beattie (button key accordion), Bob Reid (guitar, mothorgans), Chae Geddes (fiddle), Jim Gray (fiddle), Geordie Anderson (fiddle) and Bobby Dewars (piano accordion). 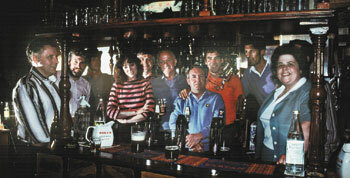 and Bella and Roy (the hosts). 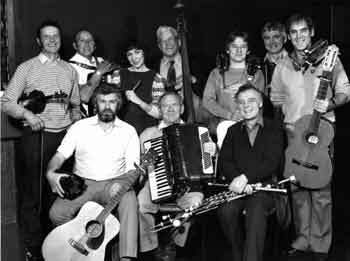 By the time the band made their second album in 1984 the number of musicians had grown and eleven musicians were in the studio at Craighall in Edinburgh. The album issued on LP as On The Road (SPR 1012) not yet (2017) reissued as CD. 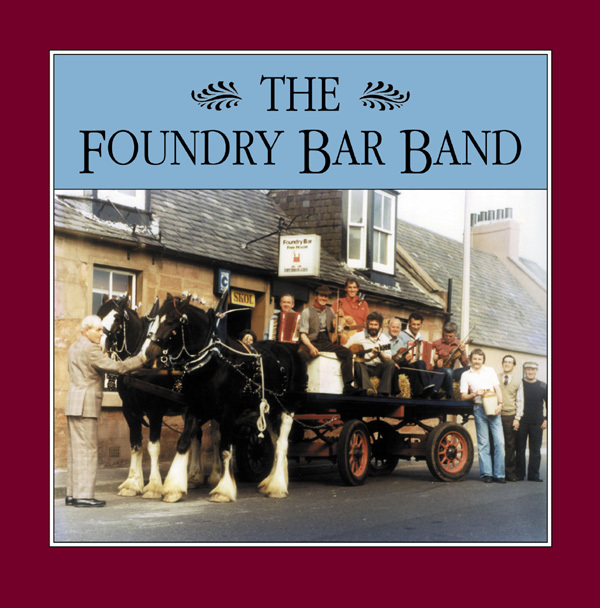 Foundry Bar Band ca. 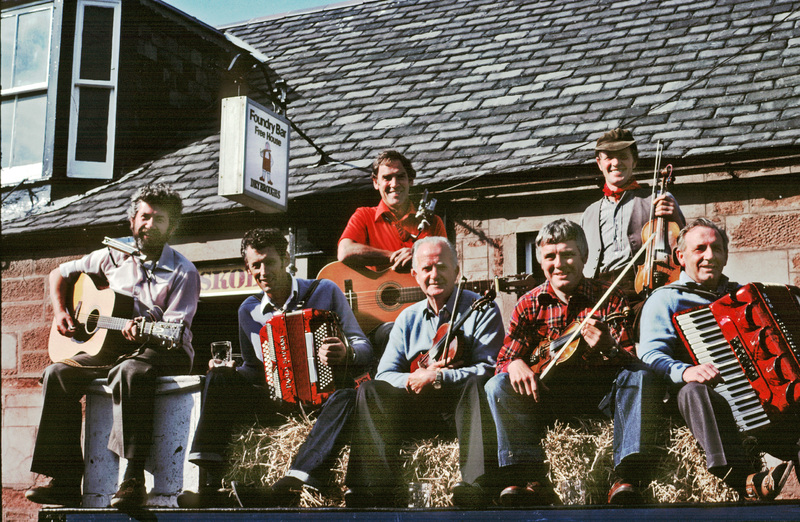 1984 (left to right): Geordie Anderson (fiddle), Bill Tosh (accordion), Jim Reid (guitar, concertina, moothie & songs), Helen Forbes (tin whistle), Bobby Dewars (button box), Sandy Beattie (bass), Jim Dewars (guitar), Peter Forbes (uillean pipes), Jim Grey (fiddle), Bob Reid (guitar, moothie).